!WARNING is the coolest bar trick ever! Pick up a lighter, peel off the label, light it, and in a flash of fire, the label instantly re-appears back on the lighter, which can be handed out and used regularly. !Warning is the perfect ice breaker for any magician. !WARNING is an incredible new magic effect that is fast, visual, direct and amazing. Easy to learn, fun to practice, and addicting to perform, !WARNING is a perfect opener and a stunning closer. 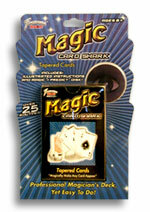 Completely natural magic you can perform anywhere, anytime! Perfect for the casual magician wanting to blow away his friends who have seen it all or for the professional magician wishing to instantly amaze his audience. !WARNING is flashy and gets everyone's attention. It is also dangerous, requires concern for your safety and the safety of those around you. Thus it is not sold to minors and it's important that you read the Terms and Conditions of Purchase. You will receive 50 of the necessary gimmicked flash-labels, matching un-gimmicked stickers, and a DVD filled with over 60 minutes of instructions, performances, and four brand new bonus effects! Just provide your own lighter - virtually any lighter will work, and you're set to amaze! !WARNING is a surprisingly simple trick that is easy to learn for any performer no matter what your level of magic. However, proper practice and attention to detail is MANDATORY due to the nature of this dangerous illusion. Within a few minutes of receiving the labels and watching the instructions you will have a full understanding of the effect. By purchasing this product, you are verifying that you are over the age of 18. "!WARNING" is intended for use by professionals and is used at their own risk. Manufacturer makes no warranties expressed or implied and assumes no liability for the hazards inherent in performing "!WARNING." User assumes all risk and responsibility in the care, storage and performance of "!WARNING." Please read all proper care and instructions immediately upon receiving your package. Simply enter your details below and we will send you an e-mail when “Warning (RED CASE)-DVD and 50 Gimmicks) by Kostya Kimlat - Trick” is available to ship!